Weaving is a wonderful way to use color and I find tapestry weaving to be the most personal form of weaving. Whether using a small frame loom or a larger standing loom, the warp for tapestry weaving can be wound on fairly quickly. In a short period of time you can be ready to weave. There is no limit to design and color in tapestry weaving. 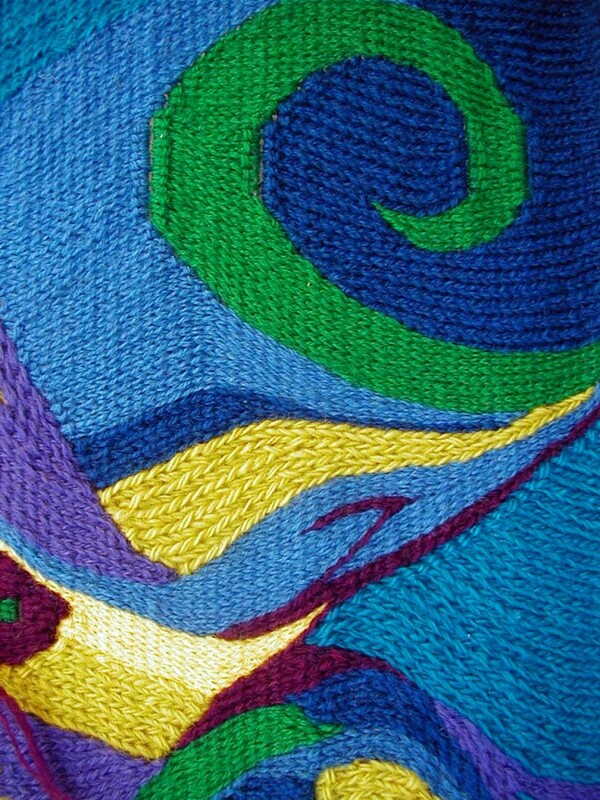 You can weave something very simple or very complex, use a few colors or many. The design can be very graphic or more painterly using multiple blended yarns. 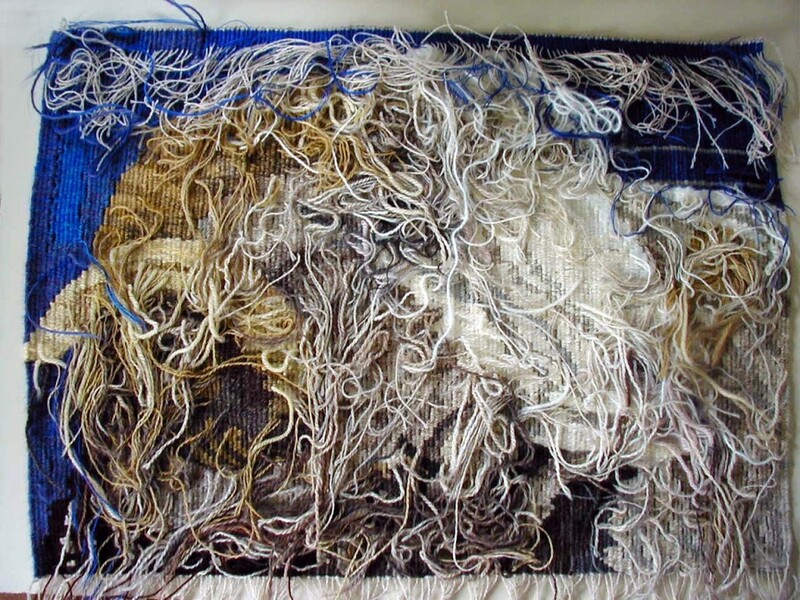 My interest in tapestry weaving began in the 1970’s when I saw an exhibit of weaving from the Ramses Wissa Wassef Workshop in Harrania, Egypt. The colors and intricate patterns were amazing, all the more so because they were done by children. So my dad made me a simple loom. 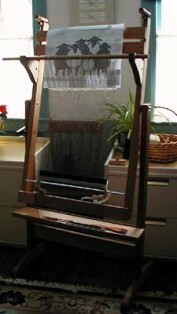 The “standing loom” I make now is based on that loom. I also make a “frame loom” for the classes that I teach. The largest tapestry loom on which I weave is one made by Ashford. When I first acquired the Ashford loom I wanted to get started on a weaving right away. I looked through my box of yarns and found the kernel of an idea. Somewhere in my books and papers was a sheep design I had done for a block print years before. 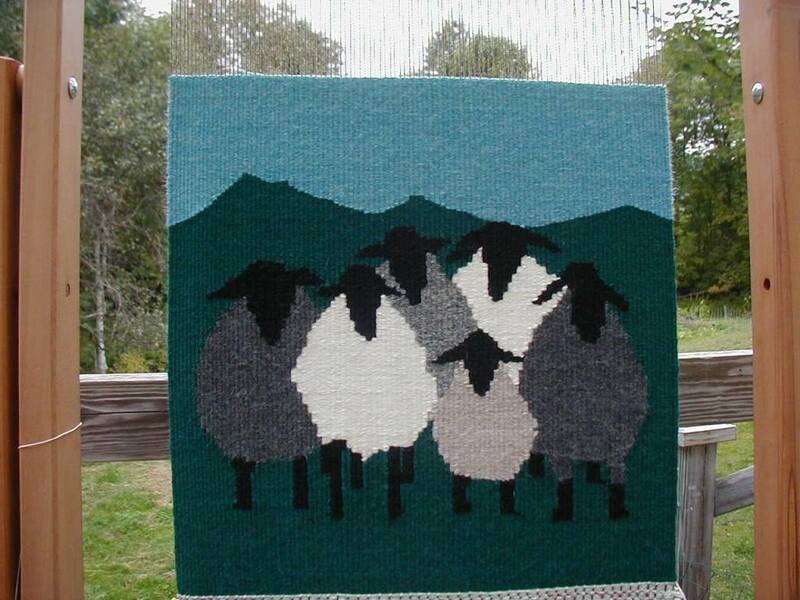 I had the colors for the sheep, a dark green for the grass and a blue for the sky. I warped the loom and expanded the design to fit. Then I made the string heddles and began the weaving. I took the loom to the Fryeburg Fair to demonstrate tapestry weaving. It took most of the week to get all the sheep legs woven. 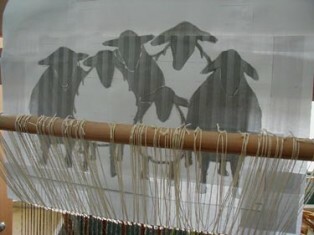 Once I began to weave the sheep bodies in the natural shades of wool the weaving went faster. 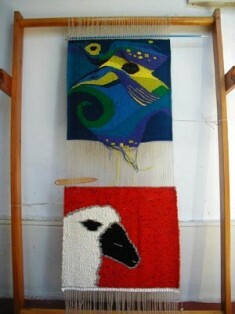 Later I demonstrated tapestry weaving in a shop window once a week to encourage people to take a class. Soon the weaving was completed. The top was finished with a hem and the bottom with knotted fringe. 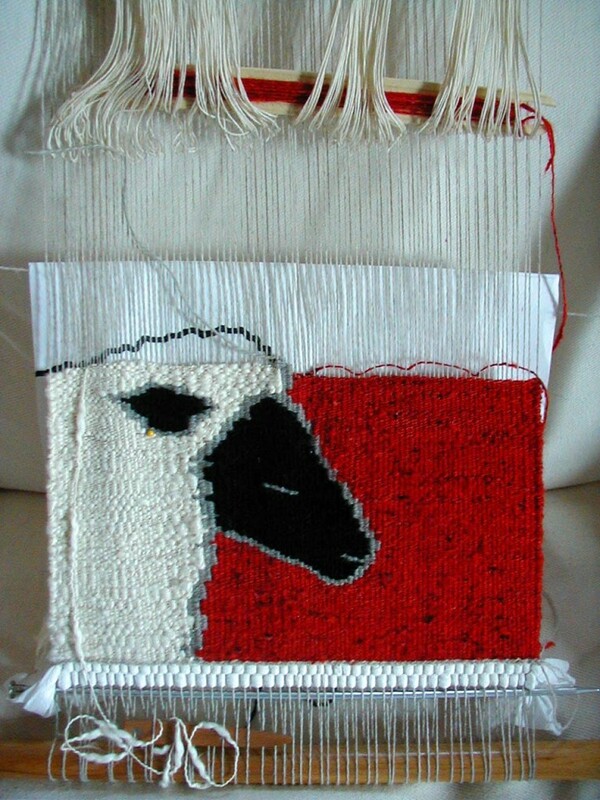 This piece has generated a lot of interest in tapestry weaving and I take it with me when I teach classes or demonstrate so that people can see different elements and techniques of the weaving. 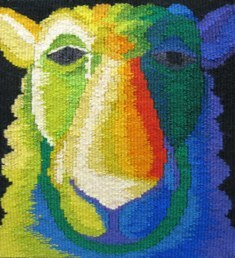 Now each year I design a tapestry to weave at the fair in the Fiber Center. The theme is always sheep. This is the second sheep tapestry in progress. I used a non-traditional yarn to weave this sheep. It is a thick and thin cotton. It posed some problems because it didn’t pack down evenly, but it did end up looking more like real fleece than if I had used a smooth wool yarn. The red yarn had a little bit of slub in it, too, but I used it because it had the little black flecks and a bit of luster that added to the overall look of the finished weaving and tied it all together. As with most things, there are more ideas in my head than time to do them all. This piece remained on the loom for a long time because I planned to use the other end of the warp to do my first Soumak weaving. Making up the design as I went along, here is a photo of the piece about half done. Sometimes I used a marker to define a shape but mostly I just played with the colors that I had selected. Soumak weaving involves using a half hitch which wraps each warp thread individually. It gives the appearance of having been knitted on the front side and looks like corduroy on the back side. This was a fun piece to weave and the curl was a challenge. 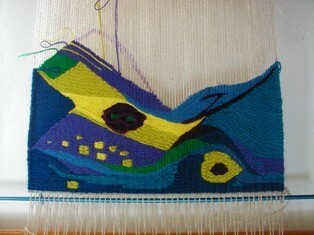 It is possible to build up curved shapes in a way that is very different from traditional tapestry weaving. For the third sheep design I was looking for something entirely different and chose to do something that would create a new challenge for me. Using my camera I went out and photographed the tops of pine trees up and down my road. Then I came back to study how they really grew. Once I had their growth pattern in my mind I sketched out a forest and colored the shapes with crayons in dark blue and shades of green. Trees? 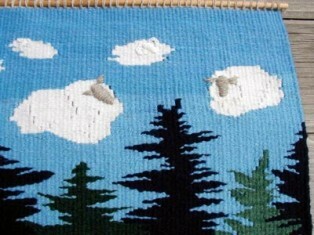 Where did the sheep come into the design? They would be fleecy white clouds in a brilliant blue sky! The challenge was to make clouds that looked like sheep and sheep that looked like clouds! 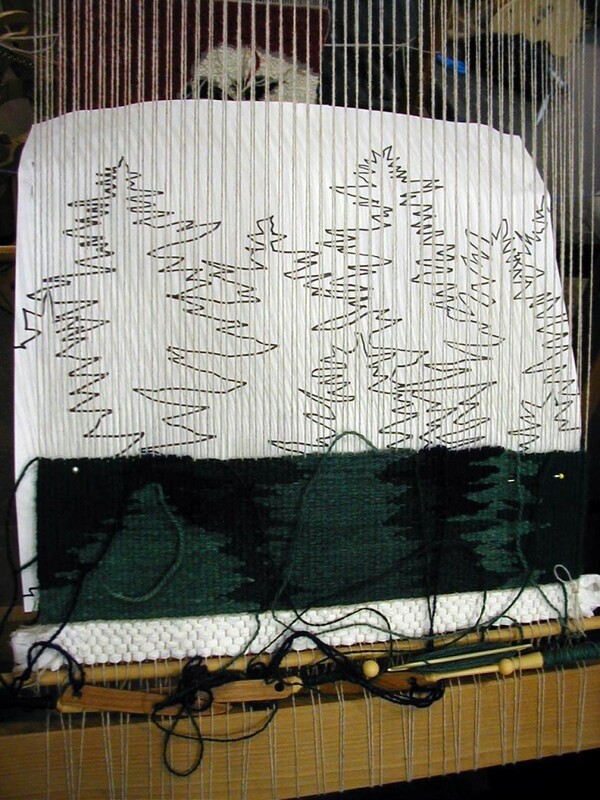 Weaving the trees was its own challenge—how to keep the weft yarns in the right shed as the branches swept back and forth over each other. To give more depth and definition to the sheep clouds I wove the white yarn in blocks leaving small slits between them for shadowing. 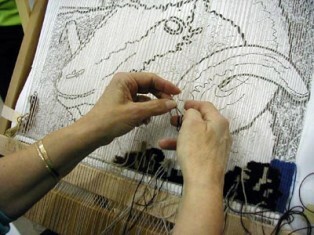 The faces, ears and horns were embroidered in satin stitch after the piece was removed from the loom. This piece was finished the day before the fair and hung on the wall of the Fiber Center that afternoon. So what would the fourth design be, what kind of challenge? Looking through my sheep photographs I found one of a Merino ram taken at the NY Sheep & Wool Festival a few years ago. He had such a wonderful set of curling horns and the light was shining over his shoulder creating lovely highlights along his face and back. Although a white ram much of his fleece was in shadow . 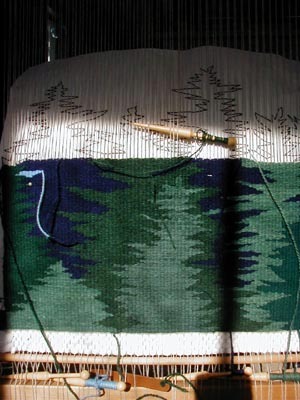 It would be interesting to translate the patterns of fleece and shadow into tapestry. The most painterly of the series so far it and the largest at 20” wide this piece took many hours to complete. The first step once the cartoon was ready and the loom was warped was to gather the yarns. I found browns and grays for the shadows and many natural off-white yarns some of which I lightly overdyed for more variation in the rendering of the fleece. The greatest challenge was to determine how to translate the fleece from the photographic image to the limitations of the weaving. I began in the lower right corner where the shadows were deepest to get my head wrapped around the process. By the time I was ready to move across the warp into the lighter areas the translation was in my head and moving down into my fingers. I had to spend many minutes moving my eyes from photo to weaving and back for this to happen. Weaving the fleece became easier as I wove although sometimes the yarn colors were so close it was hard to see the differences until a section was fully woven. 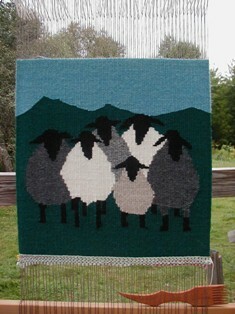 It was a challenge, too, to keep the weaving yarns in their correct shed as I was adding and shifting colors so often. There was a bright highlight along the edge of the nose and subtle shifts to create the shaping of mouth and nostrils. The whitest white yarn was some Orlon I had found. This worked when the white wool was not bright enough. Once the nose and lower fleece was completed I removed the cartoon and added some color to give me a background and to suggest the color shifts on the horns. I needed more golden browns than I had so overdyed yarns for this area as well as splitting plies and weaving two colors together for more variation. The shadows on the face required many subtle color changes and was interesting to work up next to the fleece of the cheek in contrast to the golden horn. 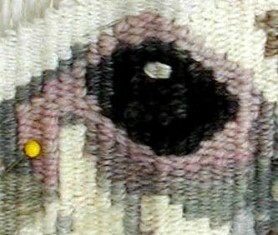 The next challenge was weaving the eye as it would make or break the work. There are six separate colors in the eye itself as well as the pink/gray areas around he eye. These are particular to Merino sheep and had to be right. 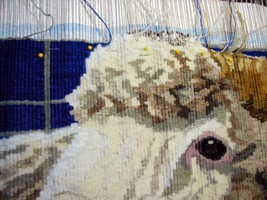 Once the eye was completed the ram came to life and was a constant companion for the rest of the weaving. The fleece on his side seemed to grow on him naturally and the highlight along his back glowed, especially after I began weaving the blue background which included the sheen of Tencel yarn in the multiple strands. 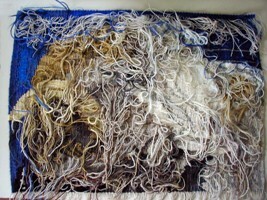 All that remained to complete the portrait was weaving his topknot fleece. Rather than have a solid background of one color I used several yarns to create a bit of textural interest but didn't want it to be too distracting. The subtle sheen of the Tencel was used only on the left above the bright white highlight to strengthen the idea of the strong light over the ram's shoulder. I had the opportunity to show this piece in a museum for three months if it was completed before July 30th so some days I worked six to eight hours a day. I did finish the weaving in time and a friend delivered it to the museum. Instead of letting this just be a hanging I chose to mount it on a frame. First I had all the loose ends to tie and clip off. Then I covered the frame with matching blue fabric and stitched the weaving at the edge. It was a challenging piece but fulfilled my desire and the original plan. It looked as if you could reach out and wrap your fingers around the horn or give the ram a good rub on the nose. 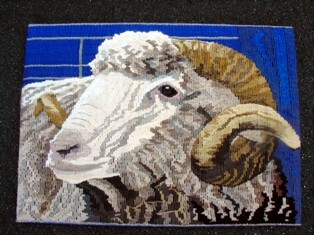 As "The Ram" was a large piece I next wove two very small pieces to show that you could still get detail in smaller woven work. While I was weaving the ends into the weaving on the back side I thought about the fact that all the sheep I had woven were natural color and determined to do my next sheep 'in living color'! That is how "Crayon Sheep" came to be. The original concept was to use fully all the rainbow colors in the weaving. First I photographed a sheep mask that I had. Then made a stylized sketch and used colored pencils so people would have a good idea of what I planned to do. This was pinned to the back of the warp and was my working cartoon. One side was to be all light colors - the sunny side and the dark colors served the shadowed side of the face. It was fun to shift from color to color and use hatching to make blended colors to create more shaping. I dyed lots of yarn but it became evident that the reds were just too much color for this small piece so I used more yellows/golds in weaving the nose. I wasn't weaving a 'Rudolph'! Because the nose divided the work it was easy to work up one side at a time filling in the minimal black background as I wove. Then I was able to weave each ear. I overdyed dark yarns to make them darker and used yellows and greens for dyeing more colors to make the transition from nose/face to fleece topknot. I was looking for a balance of colors that would give me differentiation and depth, to give "Crayon Sheep' some dimension rather than being a flat graphic representation. 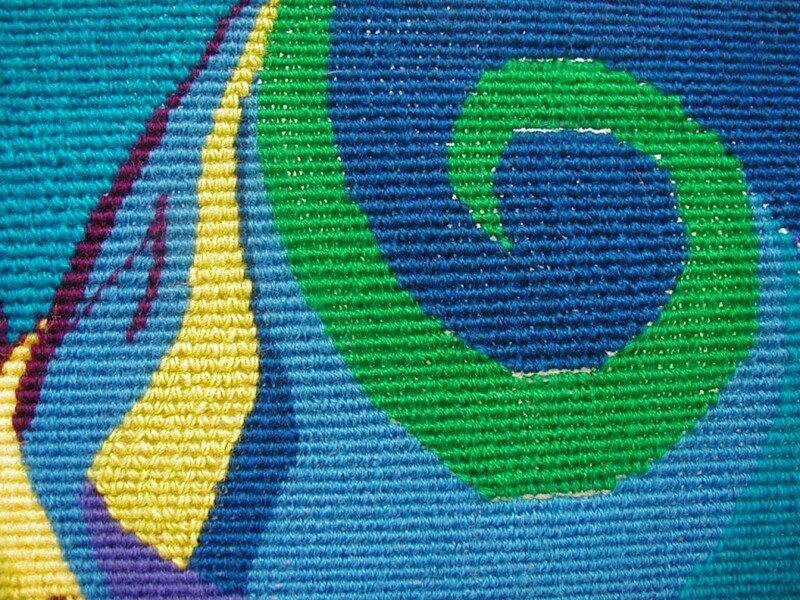 There were a lot of color changes in this piece, too, and all were woven in on the back side. Using so much color made this a very enjoyable piece and I like how he turned out when I was done. He may not be traditional but he is quite a handsome fellow! My next piece is another natural colored sheep but as usual there is a bit of a twist involved. The subject is a real animal and when the photos were printed she was actually grinning. Instead of a more literal translation of her fleece I am using fuzzier yarns to appear more fleecy with a smooth, finer yarn for the background to see how the two types of yarn will work to set the sheep a bit forward in the weaving - a play of texture to create some added depth and I am weaving the fleece in a more stylized manner than in "The Ram'.